KWI hosts a variety of conferences on caves, groundwater, public health, and more! Karst educational resources for a variety of ages and knowledge levels. 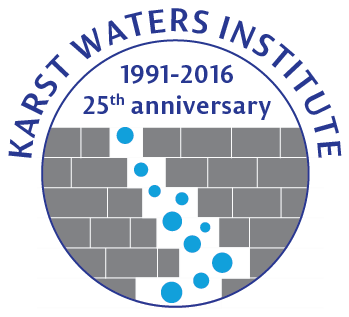 Celebrate 25 years of the Karst Waters Institute! Our annual dinner and 25th anniversary celebration will be in Warm Springs Virginia on March 12 at 6:30 pm. The dinner (including drinks) will be $60 per person and will be at the Gristmill (Waterwheel) Restaurant in Warm Springs. We will not present the karst award this year, but we will have a program on the accomplishments of KWI over the last 25 years. Please RSVP by February 19th, as space is limited. There’s still time to submit an abstract for a poster at the KWI/PROTECT Karst, Groundwater Contamination and Public Health meeting! Did you want to get involved the KWI/PROTECT Karst, Groundwater Contamination and Public Health meeting but weren’t sure how your research fit into the technical program? If so, then we encourage you to submit an abstract for a poster. See Abstracts and Snap Talks for information on how to submit your poster abstract. The poster sessions are intended to encourage interaction and can incorporate subjects that are somewhat tangential, including things like (1) related karst, public health, or outreach studies, (2) a dataset you’d like to present and discuss with others, (3) information about a related organization, and/or (4) details about a potential research site. This is your opportunity to tell others about what you’ve been doing and to get some feedback. The abstract deadline for the posters is Oct 23rd. If you have any questions, please contact us. We hope you take this opportunity to participate in the conference, learn new perspectives, and possibly meet some new collaborators.